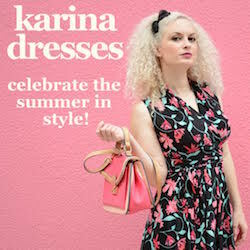 I am participating in Kara’s Deals and Steals giveaway promotion for the month of September! What better way to begin the Fall season than with a cash prize of $150? Welcome to Kara’s Deals and Steals fifth monthly Cash Bash giveaway event! This month more than 35 bloggers have joined to help me give you the chance to win the biggest Cash Bash prize to date, $150 Paypal cash! The giveaway will run from September 16th – September 30th and is open worldwide. Please enter on the Rafflecopter below and GOOD LUCK! Disclosure: I received no compensation for taking part in this giveaway. The Rebel Chick is not responsible for prize shipment or delivery. Probably buy more make up and hair care products. I could use some extra cash for taking my grandkids kids out for a little fun! I would use it to buy Christmas gifts for my girls! I’ve been saving up for a sewing machine- so this would be super helpful! I’d use it towards books for the school year. I’d surely use it for cruise packages and make my weekend more enjoyable. I’d put the money toward our Rv oil change. I’d use it to get some organizational supplies for my kiddo’s room. I would spend it on my husband! id use it to pay for gas to go see family in ky. I would use it to buy Christmas gifts for my kids! I would love to take the kids out for dinner and a movie! Groceries. Especially veggies for the freezer. I would buy birthday and Christmas gifts for my daughter. I would buy myself a new outfit! My husband deserves something nice for all his hard work, so I would spend it on getting him the new galaxy samsung phone as an upgrade. Thank you for this amazing chance to win! I would use the money toward my monthly transfer to my parents to help with their retirement costs. I would use it towards my Christmas shopping. Thanks for the chance. I would start Christmas Shopping for my kids!! I’d buy some new sweaters! i would put it towards my new computer since my old one died last week. My kids need new winter coats, and I do too! I would put the money toward an Epiphanie laptop bag! I would pay off some of my debt, and take my mother out for a mother and daughter dinner. Great ! This is useful for us !